Up to now, there have been three published versions of a yeast genome-scale metabolic model: iFF708, iND750 and iLL672. All three models, however, lack a detailed description of lipid metabolism and thus are unable to be used as integrated scaffolds for gaining insights into lipid metabolism from multilevel omic measurement technologies (e.g. genome-wide mRNA levels). To overcome this limitation, we reconstructed a new version of the Saccharomyces cerevisiae genome-scale model, iIN800 that includes a more rigorous and detailed description of lipid metabolism. The reconstructed metabolic model comprises 1446 reactions and 1013 metabolites. Beyond incorporating new reactions involved in lipid metabolism, we also present new biomass equations that improve the predictive power of flux balance analysis simulations. Predictions of both growth capability and large scale in silico single gene deletions by iIN800 were consistent with experimental data. In addition, 13C-labeling experiments validated the new biomass equations and calculated intracellular fluxes. To demonstrate the applicability of iIN800, we show that the model can be used as a scaffold to reveal the regulatory importance of lipid metabolism precursors and intermediates that would have been missed in previous models from transcriptome datasets. 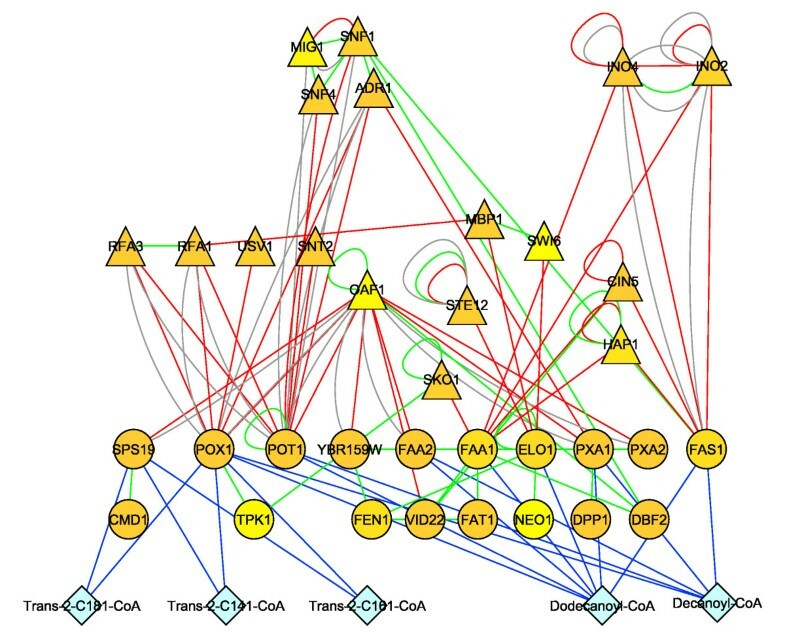 Performing integrated analyses using iIN800 as a network scaffold is shown to be a valuable tool for elucidating the behavior of complex metabolic networks, particularly for identifying regulatory targets in lipid metabolism that can be used for industrial applications or for understanding lipid disease states. The yeast Saccharomyces cerevisiae is widely used for production of many different commercial compounds such as food, feed, beverages and pharmaceuticals . It also serves as a model eukaryotic organism and has been the subject of more than 40,000 research publications [2, 3]. After the complete genome sequence for yeast was released in 1996 , about 4,600 ORFs were characterized  and yeast contains many genes with human homologs . This has allowed for comparative functional genomics and comparative systems biology between yeast and human. Yeast, for example, has been used to understand the function of complex metabolic pathways that are related to the development of human diseases [5–7]. Several human diseases (e.g. cancer, atherosclerosis, Alzheimer's disease, and Parkinson's disease) are associated with disorders in lipid metabolism [8–10]. The emergence of lipidomics has allowed analysis of lipid metabolism at the systems level [8, 11]. Lipidomics promises to make a significant impact in our understanding of lipid related disease development . As with other high-throughput techniques, however, we hypothesize that one of the main challenges for utilization of lipidome data will be our ability to develop appropriate frameworks to integrate and map data for studying relations between lipid metabolism and other cellular networks. Previous work has shown that genome-scale metabolic models provide an excellent scaffold for integrating data into single, coherent models . The calculation of Reporter Metabolites using genome-scale metabolic models is an example of how metabolic models can be used to upgrade the information content of omics data . This approach allows mapping of key metabolites and reactions in large metabolic networks when combined with transcriptome  or metabolome data . However, pathways, reactions, and genes that are not included in the metabolic network cannot be queried. Therefore, the Reporter Metabolite algorithm requires a reliable and global genome scale-model to achieve precise and accurate data interpretation. So far, three yeast genome-scale metabolic models, iFF708, iND750 and iLL672, have been published. All three models, however, lack a detailed description of the lipid metabolism. The first model, iFF708 , consists of 1175 reactions linked to 708 ORFs. iFF708 shows good predictions of many different cellular functions  and gene essentiality predictions . However, almost all intermediate reactions in lipid metabolism were either lumped or neglected. The second model published was iND750 . iND750 is fully compartmentalized, consisting of 1498 reactions linked to 750 ORFs. The model was validated by a large-scale gene deletion study and metabolic phenotypes  and was expanded to include regulation for predicting gene expression and phenotypes of different transcription factor mutants . iND750 contains more reactions and metabolites in lipid metabolism than iFF708, but still lacks a comprehensive description of lipid metabolism. The third published model is iLL672, which is derived from iFF708 and comprises 1038 reactions. Several dead-end reactions of iFF708 were eliminated leading to an improved accuracy of the single gene deletion prediction . However, only minor improvements were made to reactions involved in lipid metabolism. The model was validated using 13C-labeling experiments to study the robustness of different yeast mutants . Here our objective was to expand the genome-scale metabolic model of yeast to include a detailed description of lipid metabolism for use as a scaffold to integrate omics data. We used iFF708 as a template for building a model based on recent literature that contains new reactions in lipid metabolism and transport relative to all previous models. The new model named iIN800 includes 92 additional ORFs and provides a more detailed structure of lipid metabolism, tRNA synthesis and transport processes than previous models. The biomass composition, which is very important for flux balance analysis and predicting lethality, was also recalculated and improved. iIN800 was validated with large-scale gene deletion data and growth simulation predictions. Simulated intracellular fluxes were also supported by 13C-labeling flux experimental data. Finally, we show that the transcriptome data of yeast cultivated under various growth conditions can be integrated with iIN800 to identify lipid related Reporter Metabolites. We anticipate that iIN800 will be useful as a scaffold for integrating multilevel omic data and that this new model will have a significant impact in the emerging field of lipidomics. Due to the complexity of compartmentalization used in iND750 and the smaller scope of iLL672, the metabolic model iFF708 was selected as a template for the development of the model iIN800. Pathway and reaction databases (e.g. KEGG), online resources (e.g. SGD), and literature were used to expand iFF708, with particular focus on lipid metabolism. iIN800 contains 340 total reactions in lipid metabolism, more than at least 143 reactions greater than previous models (Table 1). To compare metabolic characteristics of the different in silico models, lipid metabolism was classified into unique sub-categories (e.g. mitochondrial fatty acid synthesis, ergosterol biosynthesis) (Table 1). Fatty acid synthesis and elongation accounted for three of these sub-categories. In contrast to previous models, iIN800 incorporates fatty acid biosynthesis in both mitochondria and the cytosol. Fatty acid synthesis, which involves iterative malonyl-CoA condensations that result in a growing chain of fatty acids, is catalyzed by four major enzymes: β-ketoacyl-ACP synthase (a condensing enzyme), β-ketoacyl-ACP reductase, β-dehydroxyacyl-ACP dehydratase and enoyl-ACP reductase. In the cytosol, these enzymes are encoded by the multifunctional FAS1 and FAS2. In the mitochondria, however, fatty acid synthesis is carried out by the products encoded by CEM1, OAR1, HTD2 and ETR1. These ORFs were missing from previous models, which prevented simulation of mitochondrial fatty acid synthesis. Fatty acid elongation, which leads to the production of long-chain fatty acids, was not included in iFF708, but was also updated in iIN800. Including fatty acid elongation resulted in the addition of four major biochemical reaction steps: condensing enzyme, 3-ketoacyl-CoA reductase, enoyl-CoA dehydratase and enoyl-CoA reductase . These reactions are carried out by the enzymes encoded by ELO1, ELO2, ELO3, IFA38 and TSC13. While the gene encoding enoyl-CoA dehydratase has not been identified in S. cerevisiae, the reaction was inferred due to the identification of long chain fatty acids in yeast. β-oxidation is the process where fatty acids, after becoming activated in the form of acyl-CoAs, are broken down to make acetyl-CoA, and ultimately energy. FAT1, encoding an enzyme for long-chain fatty acid activation was missing in iFF708 and iLL672. The genes SPS19, ECI1 and DCI1 are also now included in iIN800. As a result, iIN800 can simulate the oxidation of unsaturated fatty acids. Sphingolipid synthesis reactions were added to iIN800 according to a recently reported model , resulting in more sphingolipid reactions than the template iFF708. Sphingolipid synthesis is the only sub-category in iIN800 with a significantly lower reaction tally than iND750. This is because iND750 incorporated both C24:0 and C26:0 as very long-chain fatty acids (the back bone of sphingolipids) to produce ceramides. Because the amount of very long chain fatty acids in S. cerevisiae is so low relative to other fatty acid species (<2% of total fatty acid pool) [24, 26], iIN800 treats very long chain fatty acids as a single metabolite. As a result, fewer reactions are present in sphingolipid synthesis. Relative to other models, only minor changes in the biosynthesis of phospholipids and triacylglycerides as well as ergosterol were introduced in iIN800. However, esterification of sterols and degradation of lipids, which were not included in all other previous models, are present in iIN800 (Table 1). Finally, 26 ORFs encoding for tRNA synthesis and one related enzyme, lipoamide dehydrogenase as well as 14 ORFs encoding transporters were also included in iIN800. The additionally included ORFs and their related references as well as detailed comparisons of reactions in lipid metabolism of all reported models are given in Additional files 1 and 2, respectively. In summary, iIN800 was reconstructed from 17.2% of the characterized ORFs in yeast and contains 1446 metabolic reactions and 1013 metabolites in total. This model is relatively more comprehensive as compared with previously described models (Table 2). The network characteristics of iIN800 and the starting model iFF708 are shown in Table 3. Within lipid metabolism, we have incorporated many new reactions in mitochondrial fatty acid synthesis, cytosolic fatty acid synthesis, fatty acid elongation, fatty acid activation and β-oxidation, sphingolipid synthesis, ergosterol esterification, and lipid degradation (Table 1). 96 new reactions are derived from biochemical and physical considerations. These reactions mostly describe transportation of fatty acids and lipids across the mitochondria and the plasma membrane. To visualize the model iIN800, we constructed a comprehensive metabolic map using ReMapper software (Figure 1). This visualized map provides a method for globally plotting transcript and flux data onto iIN800. The source file is available for download (see Methods). 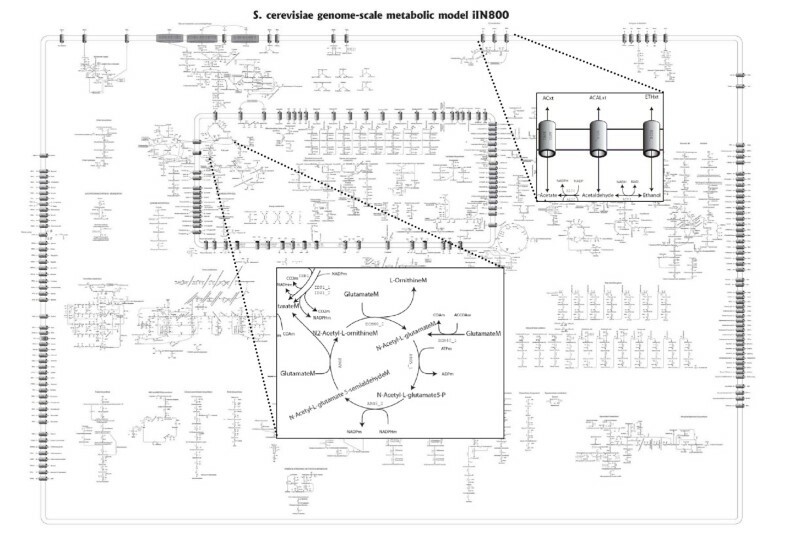 The reconstructed S. cerevisiae genome-scale metabolic model iIN800 . The biomass equation is crucial for using genome-scale models to simulate growth using flux balance analysis (FBA). Therefore, an important consideration in the development of iIN800 was to address the concern that the biomass composition of S. cerevisiae changes under different growth conditions. For example, during growth on excess glucose the carbohydrate content increases and during growth on excess ammonium the protein content increases. To assess the sensitivity of flux simulations using iIN800 towards changes in the macro-molecular composition, we performed constraint-based simulations by varying the protein, RNA, carbohydrate and lipid content of the biomass in physiological relevant ranges based on previous experimental reports [27–29], from 35–65%, 3.5–12%, 15–50% and 2–15%, respectively. Specifically, glucose and ammonium uptake rates were minimized for both glucose- and ammonium-limited growth conditions, respectively, using different macromolecular compositions at fixed growth rates, (note: this is the same mathematical problem as fixing uptake rates and maximizing growth rate). In this way, we could compare the differences between glucose- and ammonium-limited growth conditions. The results are illustrated in Figure 2. An interesting finding was that the protein content strongly affects the uptake rates at both glucose- and ammonium-limited conditions, albeit to a greater extent in ammonium-limited conditions (Fig. 2A). The carbohydrate content on the other hand does not have an impact on the ammonium uptake rate, it strongly impacts the glucose uptake rate (Fig. 2C). The RNA content and the lipid content have only a minor impact on growth (Figures 2B and 2D). Sensitivity analysis shows the influence of macromolecular composition on the simulated growth rate using iIN800 . The simulations were performed for aerobic glucose- and ammonium-limited cultivations by varying (A) the protein content (35–65%), (B) the RNA content (3.5–12%), (C) the carbohydrate content (15–50%) and (D) the lipid content (2 – 15%). In summary, the sensitivity analysis shows that the biomass composition can significantly impact predictions made with genome-scale metabolic models to varying degrees based on different growth conditions. We therefore present new biomass equations to be used under C-limited and N-limited growth conditions, respectively. These compositions result from previous studies and our own measurements of lipids and fatty acids across multiple N-limited and C-limited growth conditions (data not shown). Using a separate biomass composition for N-limited cultures has not been proposed previously. The N-limited biomass equation is therefore new. Relative to previous C-limited biomass compositions, the most dramatic changes in our here proposed biomass equation is with respect to the lipids and fatty acids (Table 4). While our sensitivity analysis suggests that these components will most likely only lead to a small improvement in the accuracy of C-limited flux simulations, they may play an important role in lethality prediction by the model, as the addition of extra components in the biomass equation will give a higher resolution. In silico genome-scale models are most generally used to predict various phenotypes. These include growth rates and extracellular secretion rates of metabolite products, as well as uptake rates of nutrients. In addition, models can be employed to explore active route(s) in metabolic pathways under certain growth conditions as illustrated for a genome-scale metabolic model of E. coli [30–32] as well as for one of the S. cerevisiae genome-scale metabolic models . To validate iIN800, we first investigated the model's ability to simulate aerobic and anaerobic growth in glucose- or ammonium-limited conditions. Several published chemostat datasets were used as experimental references. As shown in Figure 3, the results from the computational growth prediction agreed with experimental measurements. Less than 10% relative error was observed (Figure 3). The details of the simulations and the corresponding reference data are given in Additional file 3. Intracellular fluxes can be easily visualized using the ReMapper software and our model (Additional files 4 and 5). Comparison demonstrating in silico and in vivo growth rates at various cultivation conditions. In silico predictions were performed using FBA with iIN800. Experimental measurements were taken from the literature (see text for references). 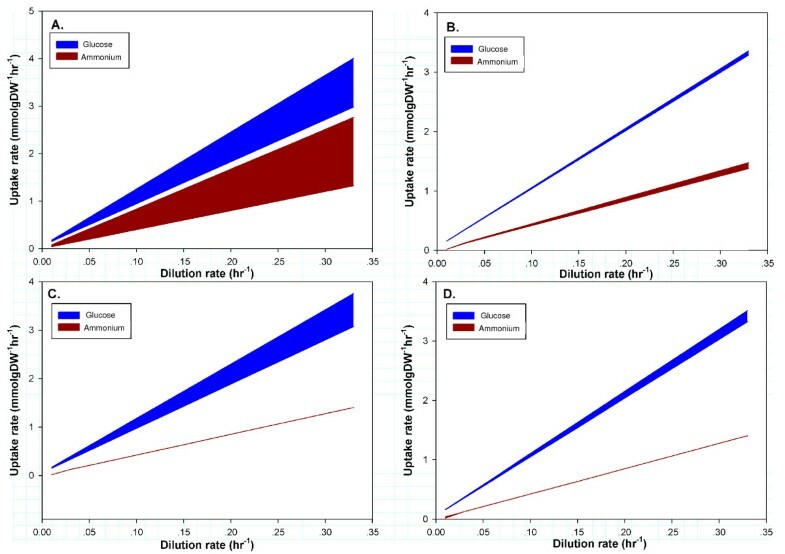 Since the new biomass equations would be expected to impact the overall flux distributions, we used 13C-flux analysis data to further confirm the computed intracellular fluxes. Specifically, fluxes in the central carbon metabolism at two different growth conditions were both measured by 13C-labeling experiments and calculated by FBA using iIN800. The model validation is shown in Figure 4. There is a high degree of agreement between the predicted and experimental fluxes in the central metabolism, with the exception of fluxes through the pentose phosphate pathway (PPP). Using FBA, the flux through the PPP is largely determined by the requirement for NADPH, and it has earlier been shown difficult to balance NADPH production and consumption . This may explain why the FBA simulations under-predict the flux through this pathway. 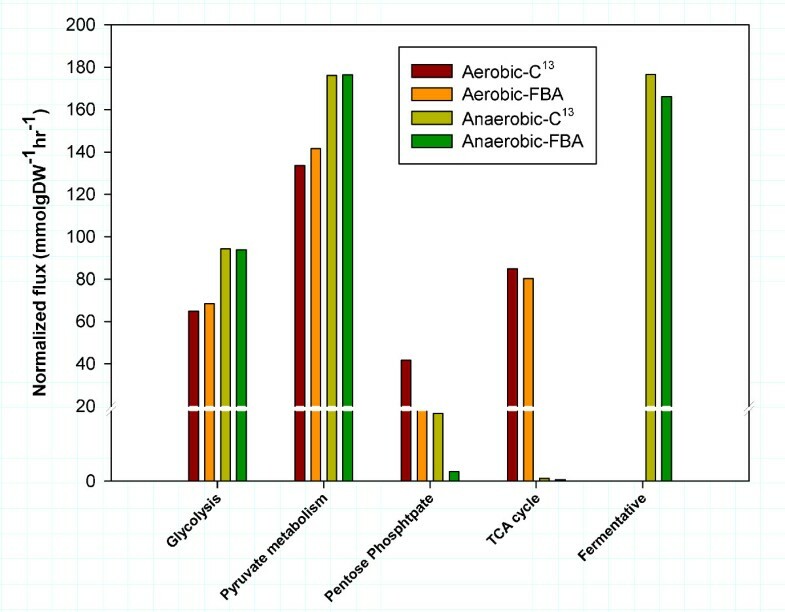 Comparisons of the major intracellular fluxes in the central metabolism calculated using FBA with iIN800 and 13 C-labeling metabolic flux analysis at a dilution rate of 0.05 h -1 of either aerobic or anaerobic glucose-limited conditions. Summary of large-scale single gene deletion evaluation of S. cerevisiae iIN800. TP = true positive, TN = true negative, FP = false positive, FN = false negative. Genome-scale metabolic models have shown promise for identifying Reporter Metabolites, defined as metabolites whose neighboring genes in a bipartite metabolic graph are most significantly affected and respond as a group to genetic or environmental perturbations . Such an approach has previously been used to reveal important regulatory hot-spots in metabolism from genome-wide expression data and has demonstrated promise for integrating omic data using network topology. To highlight the importance and utility of having a more complete metabolic model in this integrated analysis, the genome-scale models iIN800 and iFF708 were used to calculate Reporter Metabolites. Multiple sets of transcriptome data were used for analysis. Lists of the top thirty most significant Reporter Metabolites for several perturbations are compared between iIN800 and iFF708 in Table 6, and Reporter Metabolites unique to iIN800 are marked in bold. Top thirty Reporter Metabolites calculated from various perturbations. The Reporter Metabolite algorithm was performed with iIN800 and iFF708. First, transcriptome data from the yeast metabolic cycle  were analyzed. Notably, the reporter algorithm identified unique Reporter Metabolites with iIN800 that would have been missed if iFF708 was used as the scaffold (Table 6). The most dramatic difference was observed for the reductive charging phase of the metabolic cell cycle. While both models revealed the importance of regulation controlling the cellular response at glycogen, trehalose, UDP-glucose, glucose-6-P and glucose nodes, only iIN800 was able to identify key intermediates in β-oxidation. For example, iIN800 identified trans-3-acyl-CoAs, trans-2-acyl-CoAs, 3-keto-acyl-CoAs and some fatty acids as Reporter Metabolites (Table 6). This result demonstrates the advantage of expanding the metabolic model to include a much more detailed description of lipid metabolism. Namely, we can now use the genome-scale metabolic model to identify the regulatory importance of lipid precursors and intermediates at different physiological conditions or at different phases of cellular growth. Searching for highly co-regulated subnetworks that implicate lipid genes is also now possible. Further demonstrations of the applicability of iIN800 as a scaffold to integrate omic data were performed by analyzing transcriptome data derived from nutrient-limited , oxygen-limited  and temperature stress conditions  Previously, mRNA and protein levels of genes and enzymes in fatty acid catabolism have been shown to be significantly different between carbon-limited and nitrogen limited growth . When comparing these conditions, only iIN800 was able to identify fatty acids as Reporter Metabolites (Table 6). In anaerobic yeast cultivation, oleic acid has to be added to the medium because unsaturated fatty acids synthesis is not possible; therefore, the expression of genes in this pathway is induced by the function of the ORE element . Consistent with this observed cellular response, only iIN800, with identified Reporter Metabolites involved in β-oxidation (Table 6). Similarly, iIN800 was able to highlight the importance of unsaturated fatty acids when comparing high and low temperature cultivations (Table 6), which is known to be important for maintaining proper membrane structure and fluidity . Without the expanded model, the importance of cellular regulation stemming from lipid metabolism would be missed in analyses where metabolic topology is used for integrating data. As an illustration, we integrated results from our Reporter Metabolite analysis with known protein-protein and protein-DNA interaction networks to infer regulatory structure. First, genes associated to Reporter Metabolites in lipid metabolism unique to iIN800 and determined when comparing carbon- and nitrogen-limited growth (decanoyl-CoA, dodecanoyl-CoA, trans-2-C141-CoA, trans-2-C161-CoA, trans-2-C181-CoA) were identified. These genes were then used to search for highly regulated subnetworks within a protein-protein and protein-DNA interaction network. By applying a p-value threshold of 0.01 to filter for genes with significant gene expression, we inferred a regulatory network controlling the expression of lipid metabolism genes associated to the Reporter Metabolites (Figure 5). Strikingly, regulators at the top of this hierarchy are consistent with those previously known to be significantly changed between carbon- and nitrogen-limited growth. These include: SNF1, SNF4, MIG1 and ADR1 (glucose repression), OAF1 (β-oxidation), and INO1 and INO4 (phospholipid synthesis), among others. Previously reported genome-scale models are not capable of being used as scaffolds for implicating the conditional response of these lipid metabolism regulators because they lack a detailed description of lipid metabolism. Regulatory module implicated in the control of lipid metabolism genes associated to iIN800 Reporter Metabolites, which were determined by comparing N-limited and C-limited growth. Without the expanded model iIN800, the importance of cellular regulation stemming from lipid metabolism would be missed. High scoring Reporter Metabolites (diamonds), metabolic genes associated to Reporter Metabolites (circles), and genes encoding regulators (triangles). The blue, red, gray and green edges represent metabolite-gene interactions from the genome-scale metabolic model, protein-DNA interactions from ChIP-CHIP data, protein-DNA interactions from YPD and protein-protein interactions from BioGRID, respectively. Genome-scale metabolic models have emerged as a valuable tool in the post-genomic era for illustrating whole-cell functions based on the complete network of biochemical reactions. An iterative reconstruction process is required to achieve a comprehensive S. cerevisiae genome-scale metabolic model. In this work, we focused on improving the formulation of lipid metabolism relative to previously published S. cerevisiae genome-scale metabolic models. Validating the model and new biomass equations, the constraint-based simulation of iIN800 showed accurate predictions of cellular growth and is also consistent with 13C-labeling experiments. Furthermore, in silico gene essentialness predictions were found to be in high agreement with in vivo results. Finally, we show that iIN800, being more complete, is a better network scaffold for integration of multilevel omics data. In conclusion, by incorporating a more complete description of lipid metabolism, iIN800 is positioned to have a broader impact than previously described yeast models. Its capability of predictions were consistent with a number of experimental data both quantitatively (growth rate) and qualitatively (gene essentialness). Moreover, the new model is positioned to be used for studying the regulation and role of lipid metabolism during different growth conditions. With the high degree of homology in lipid metabolism between yeast and humans and emergence of lipidomics, this is expected to allow for new insights into the connection between lipid metabolism and overall cellular function for industrial and medical applications. Reconstruction of the S. cerevisiae genome-scale metabolic model was done by expanding iFF708 . The additional ORFs included in the expansion procedure were involved in lipid metabolism, tRNA synthesis and lipoamide dehydrogenase. These ORFs were added based on publications listed in Additional file 1. Online resources related to S. cerevisiae, such as SGD , MIPS  and YPD , were also used to confirm the existence of the ORFs and their function. Pathway and reaction databases including KEGG , ExPASy , and Reactome , were used together with research papers to identify relevant information of the additional reactions and metabolites, e.g. stoichiometry and co-factor usage. The expanded iFF708, called iIN800, was visualized by Adobe Illustrator software (Adobe Systems), and then converted to EPS format (Adobe Systems) format which is downloadable as Additional file 6. In this visualization file, it is possible to overlay information about transcription, fluxes etc. A detailed list of metabolic reactions in iIN800 is provided as Additional file 7. Here v is a vector that contains all the fluxes in the model. Equation 1) has a large number of degrees of freedom, i.e. it is an underdetermined problem, and linear programming was employed to solve the equation system by maximizing an objective function Z (equal to the growth rate), an approach generally referred to as flux balance analysis (FBA) [30, 47]. The problem formulation is described below. where α and β are lower and upper bounds of fluxes respectively, ω is a weight vector indicating an amount of desired metabolites for biomass synthesis. For irreversible fluxes semi-positive infinite boundary was applied as 0≤ v≤ ∞, and fully infinite boundaries was applied as -∞ ≤ v≤ ∞ for reversible fluxes. The problem was solved by using the commercial linear programming software package LINDO (Lindo systems Inc., Chicago, IL, USA). The calculated intracellular fluxes were overlaid on the visualized genome-scale map as described previously by the ReMapper software (The software has been developed for visualization of multilevel omics data onto a metabolic map.). The biomass composition was re-calculated in order to improve the prediction of the model during growth at different nutrition-limitations, i.e. carbon- and nitrogen-limited growth condition. The contents of macro-molecules were extracted from the thesis of Schulze  who measured the biomass composition at a dilution rate of 0.1 h-1. The calculations were performed as described previously . The calculation of protein precursors, i.e. amino acids, and carbohydrate precursors, i.e. trehalose, glycogen, manna and glucan, were adopted from Schulze's work . Deoxyribonucleotide and ribonucleotide compositions were calculated from the study of Vaughan-Martini and co-workers . Lipid compositions were calculated from our own measurements of structural lipidomics, which contains phospholipids, triacylglycerol, sterols, sterol-esters, sphingolipids, free fatty acids and fatty acids composition of all measured lipid classes (unpublished data). The impact of the macromolecular composition on biomass yield was explored in aerobically glucose- and ammonium-limited conditions by fixing the specific growth rate and then minimizing the glucose and ammonium uptake rates at both glucose- and ammonium-limited growth conditions. Four parameters were evaluated, namely the protein, RNA, carbohydrate and lipid content of the biomass. The metabolic capabilities of iIN800 were evaluated by using FBA and linear programming to simulate the biomass flux representing the in silico growth rate, which were derived by maximizing the biomass production. 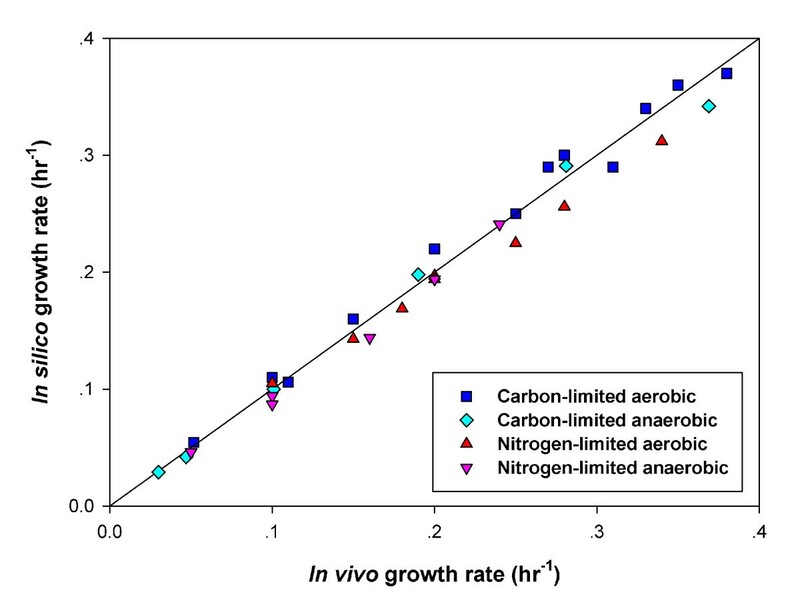 Data from various carbon-limited and nitrogen-limited chemostat experiments performed at either aerobic or anaerobic growth condition were taken from the literature for comparisons (see references in Additional file 3). These data were used to validate the metabolic capabilities of the model by comparing in silico biomass yields with in vivo biomass yields. The in silico biomass yields were calculated by fixing measurable uptake rates of extracellular metabolites, such as glucose, ammonium and oxygen, as well as secretions rates of acetate, glycerol, ethanol, succinate, pyruvate and carbon dioxide. The biomass equation (or flux), which was the objective function, was changed depending on the growth conditions evaluated according to the data provide in Table 4.
where TP = true positive, TN = true negative, FP = false positive, FN = false negative. Positive and negative values referred to viable and lethal phenotype, respectively. Published microarray data were retrieved from Gene Expression Omnibus (GEO) . The CEL files were normalized by the dChip software  in order to minimize overall intensity variation among a set of chips. The statistical test of significance was done by ANOVA or student t-test for p-value calculation. Briefly, we describe the Reporter Metabolite calculations. The genome-scale model was converted to a bipartite undirected graph. In this graph each metabolite node has as neighbors the enzymes catalyzing the formation and consumption of the metabolite. The transcriptome data were mapped on the enzyme nodes using the significant values of gene expression. The normal commutative distribution was used to convert the p-values to a Z-score for further calculations. To identify an importance of metabolites in the metabolic network of the particular experimental conditions, the reporter algorithm was applied as described earlier . The interactome network was initially constructed with data obtained from YPD , ChIP-chip databases  (protein-DNA interaction) and BioGRID  (protein-protein interaction). The candidate genes of high scoring Reporter Metabolites were retrieved from the bipartite metabolite-gene encoding enzyme interaction graph. They were then used to identify subnetworks from the interactome network . Significantly changing p-values from microarray data were mapped on the subnetwork and then also genes having a p-value < 0.01 directly connected with the Reporter Metabolites. The module was visualized by Cytoscape software . The authors gratefully thank Mikael Rørdam Andersen and Kiran Raosaheb Patil for providing the ReMapper and the Reporter software, respectively. This work is supported by a grant from the National Center for Genetic Engineering and Biotechnology (BIOTEC) (grant number BT-B-06-NG-B5-4602). Intawat Nookaew gratefully acknowledges financial support by Thai Graduate Student Institute Science and Technology (TGIST). Michael C. Jewett is grateful to the NSF International Research Fellowship Program for supporting his work. IN designed the study, performed the metabolic reconstruction and validation, and contributed to manuscript writing. MCJ carried out the C13-labeling flux experiments, helped curate the model and contributed to manuscript writing. AM, CT, KL and SC contributed to the manuscript preparations, JN and SB participated in the concept and design of the study. All authors read and approved the final manuscript.